FORWARD OPERATING BASE SHARANA, Afghanistan, April 27, 2011 — To the strains of “Amaz­ing Grace,” hun­dreds of Task Force Cur­ra­hee sol­diers slow­ly filed into a ware­house-like mul­ti­pur­pose room here yes­ter­day. At the front of the room, fac­ing rows of sim­ple fold­ing chairs, were the upright rifle, boots, hel­met, dog tags and pho­to­graph of a man they will nev­er see again. 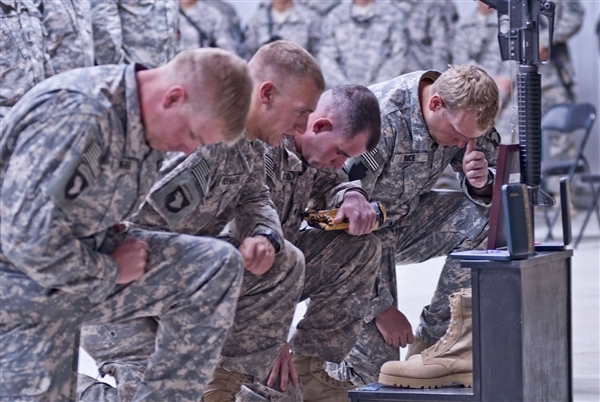 Dur­ing an April 26, 2011, memo­r­i­al ser­vice at For­ward Oper­at­ing Base Sha­rana, sol­diers from the 101st Air­borne Division’s 4th Brigade Com­bat Team pay their respects to Army Sgt. John Cas­tro, who was killed April 22, 2011, by ene­my small-arms fire dur­ing a bat­tle in Afghanistan’s Pak­ti­ka province. The 101st Air­borne Division’s “Cur­ra­hee” 4th Brigade Com­bat Team from Fort Camp­bell, Ky., gath­ered to pay trib­ute to the 16th of its own to die since the brigade deployed to Afghanistan’s Pak­ti­ka province last sum­mer: Army Sgt. John Paul Cas­tro, a 25-year old hus­band and father of two, who was killed April 22 when his unit was attacked by ene­my small-arms fire. Castro’s bat­tal­ion com­man­der, Army Maj. Justin Reese, spoke of the sol­dier who had been assigned to “Deal­er Com­pa­ny,” 1st Bat­tal­ion, 506th Infantry Reg­i­ment, for his entire sev­en-year career, deploy­ing once to Iraq and twice to Afghanistan. Castro’s last mis­sion was “a fight that occurred at dis­tances mea­sured in hand-grenade range, with­in a com­plex envi­ron­ment of walled mazes and col­lapsed struc­tures dur­ing the hours of dark­ness,” Reese said. “It was with­in this con­text — clos­ing with and destroy­ing a deter­mined ene­my force — that Sergeant Cas­tro gave his life.” Reese praised Cas­tro as a lov­ing hus­band and father, broth­er and son. Castro’s pla­toon leader and two of his fel­low sol­diers also spoke, remem­ber­ing the sergeant’s love for his wife and chil­dren, music and sports, fam­i­ly cook­outs and work­ing on cars. Army 1st Lt. Gre­go­ry Shoe­mak­er said Cas­tro was the sort of non­com­mis­sioned offi­cer that every pla­toon leader wants serve with: a man of unpar­al­leled dis­tinc­tion, the embod­i­ment of a sol­dier, ded­i­cat­ed and men­tal­ly and phys­i­cal­ly resilient. Army Spcs. Joseph Rhodes and Bo Rice said Cas­tro was a ded­i­cat­ed leader, friend and men­tor. Rhodes said Cas­tro was pas­sion­ate about sports, and had “a fierce per­son­al­i­ty to be the best he could be,” yet always was ready to make friends laugh or help them through their trou­bles. Army Chap­lain (Maj.) Ran­dall Robi­son read the 23rd Psalm and spoke of the young man the assem­bled sol­diers were there to hon­or. “Remem­ber­ing his com­mit­ment to his fam­i­ly, his team, his unit and his coun­try should inspire all of us to dig deep, to do our best,” he said. Each sol­dier — two by two, then four by four — marched to, salut­ed, and knelt before Castro’s dis­played boots and hel­met. Many of them placed tokens of remem­brance on and around the wood­en stand sup­port­ing the boots. A video game, a card list­ing the Army val­ues, var­i­ous unit coins, a base­ball and a base­ball glove were among the offer­ings. One sol­dier ripped the air­borne and divi­sion patch­es from his sleeve and laid them down. The memen­tos will be deliv­ered to Castro’s fam­i­ly.